Meadowlark Forsythia This shrub is an ‘Idaho Preferred’ Plant. Meadowlark Forsythia is a very hardy shrub for our area. 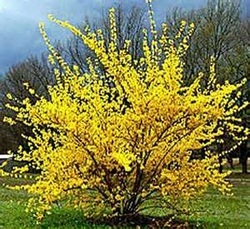 It is loaded with yellow blossoms on its 8' to 10' arching branches before the leaves appear. Plant this shrub in full sun for heavier flowering. Plant Meadowlark in a grouping or a shrub border. It is one of the first shrubs to flower in the spring. With maturity, it becomes very dense and will provide cover for wildlife. The blossoming branches make an excellent cut flower. Meadowlark Forsythia is deer resistant and is a Firewise plant.